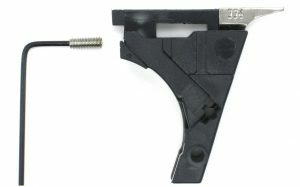 This 4.5 (previously named 3.5) OEM Minus Glock connector has been tuned for a light, crisp break and reset. All the factory stampings have been removed and polished for a smoother trigger pull over the stock part. 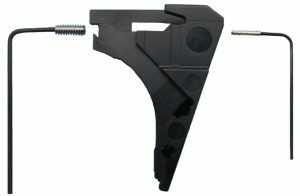 This factory Glock connector can be used for GSSF events. Fits all Glock models except G42, G43. 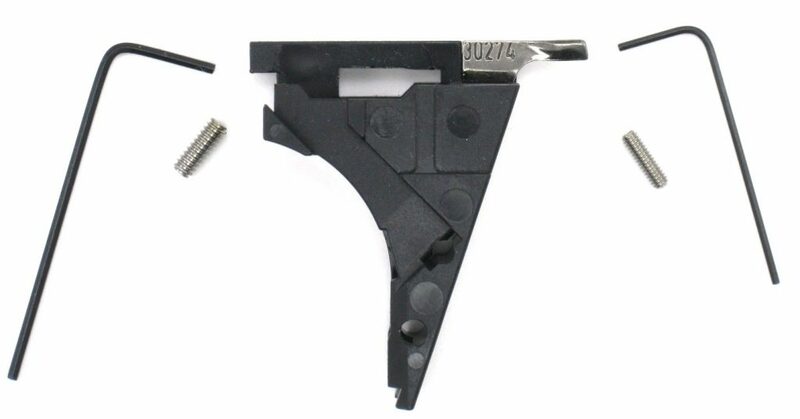 Note: These connectors are not used in the Classic Trigger Kits. The firing pin safety has been modified from the factory to help eliminate the firing pin from hitting the safety and still function the way it was intended to. Plus, all the factory edges have been reworked and polished for a smoother trigger pull. Note: Does not fit G42 / G43. Generations 1 - 4 - G42 - G43 Trigger Housing! The adjustable over-travel stop is preset when shipped. Loctite has been applied to the setscrew even though it has been installed in a way that it will not move under recoil. A hex wrench has been included for fine tuning to your preference. The setscrew has been milled and polished on the end where the trigger bar hits resulting in a smoother action. Generations 1 - 4 Trigger Housing! This trigger housing comes with a furnished hex wrench for the setscrew installed in the trigger housing which allows you to adjust the pre-travel distance to your preference. The adjustable over-travel stop is preset when shipped and Loctite has been applied to the setscrew even though it has been installed in a way that it will not move under recoil. 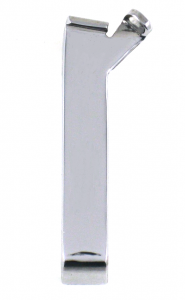 A hex wrench has also been included for fine tuning the over-travel to your preference. The setscrew has been milled and polished on the end where the trigger bar hits resulting in a smoother action. Disclaimer: When removing the pre-travel, the installer must be knowledgeable regarding the safeties function, and it is their responsibility to keep the safety's working properly. Gen5 9mm Trigger Housings Available! This part does not have pre-travel removed when shipped. Gen 5 9mm - It comes with an ejector (marked 30274), trigger spring and hex wrenches for the setscrews installed in the trigger housing, allowing pre-travel and over-travel adjustment. 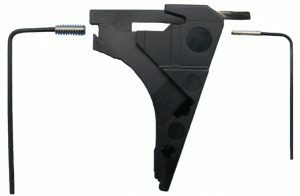 The adjustable over-travel stop is preset when shipped and loc-tited, although the setscrew has been installed in a way that it will not mover under recoil. It can be fine tuned to your preference with the furnished hex wrench. The setscrew has been milled and polished on the end where the trigger bar hits for a smoother action. Disclaimer: When removing the pre-travel, the installer must be knowledgeable regarding the safeties function, and it is their responsibility to keep the safeties working properly. Gen 5 Trigger Housing (No Ejector) - Use your ejector in my Pre-travel/Over-Travel Stop Trigger Housing. The ejector can be pulled out of your housing with pliers, and then inserted in my custom housing. This part does not have pre-travel removed when shipped. It comes with trigger spring and hex wrenches for the setscrews installed in the trigger housing that allows you to adjust the pre-travel and over-travel. The adjustable over-travel stop is preset when shipped and loc-tited even though the setscrew has been installed in a way that it will not move under recoil, but can be fine tuned to your preference with the furnished hex wrench. The setscrew has been milled and polished on the end where the trigger bar hits for a smoother action. Disclaimer: When removing the pre-travel, the installer must be knowledgeable regarding the safeties function, and it is their responsibility to keep the safeties working properly.